BISMARCK, N.D. — The congressman and the senator circled each other, sometimes so close they were back-to-back, but always finding anyone’s hand to shake but each other’s. 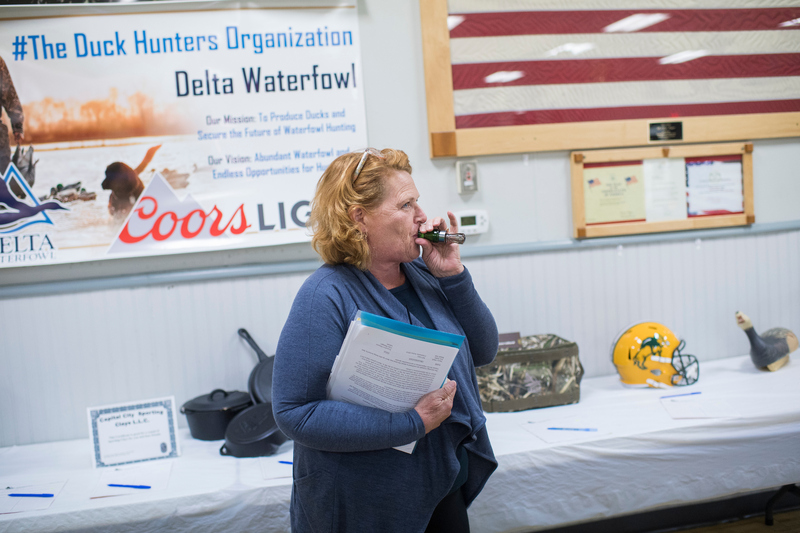 Democratic Sen. Heidi Heitkamp and GOP Rep. Kevin Cramer, in their official capacities, both turned up at an airport hangar last week for an informal send-off for National Guardsmen being deployed to the Horn of Africa. They’re facing each other in an increasingly nasty race for a Senate seat Democrats need to hold if they’re going to have a chance to win the majority. Control of the narrowly divided Senate could either propel or derail President Donald Trump’s agenda — and perhaps even decide the future of his presidency if he is impeached. But Heitkamp and Cramer were focused on giving the service members a bipartisan sendoff at the hangar. Asked to say a few words, the candidates closed the noticeable physical gap between them and laughed about how they’d usually be singing the national anthem at an event like this. 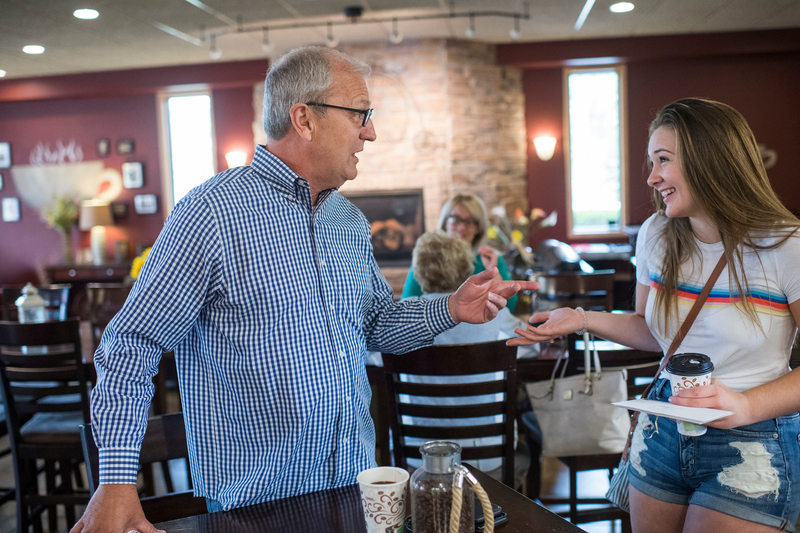 “She can sing it,” Cramer said, jovially gesturing toward Heitkamp, who’s now Republicans’ top Senate target this fall. Inside Elections with Nathan L. Gonzales rates the race Tilts Republican. “Maybe better than you,” Heitkamp shot back. Their limited interaction was a reflection of the awkwardness of campaigning against a fellow member of the delegation, one who’s also been representing the entire state in Washington, D.C., since 2012. Both Cramer, a three-term congressman, and Heitkamp, a first-term senator, are well-known in the state. They both held statewide office before heading to Washington and are counting on their connections carrying them through November. But they have different ways of emphasizing their value to North Dakota. Heitkamp’s capitalizing on her folksy charm and independent bona fides to try to overcome the redness of the state, which backed Trump by 36 points in 2016. “He’s going to be a factor. He’s popular in North Dakota,” Heitkamp said of the president in an interview at Bismarck’s Amvets Club last week. Meeting with veterans, she touted the bipartisan banking deregulation bill she worked on, making sure to note that the president signed it. She was at Trump’s side when he signed it into law at the White House. The president once called her a “good woman” and considered her for his cabinet. But he’s since campaigned in the state for Cramer, whom the White House recruited into the race, and Republicans are using that footage in their ads. “Congressman Cramer has basically said, ‘I should get elected because the president likes me better than he likes her, and I’ll be with him 100 percent of the time,’” Heitkamp said. “I’m saying vote for me because I’m from North Dakota, not from a political party,” she added. The only statewide-elected Democrat, Heitkamp’s a natural retail politician. In the span of an hour last week at the Amvets Club, she exchanged salty jokes with men setting up a silent auction, learned how to blow a duck call and moderated a wonky roundtable on veterans issues. Ads from the Cramer campaign explicitly refer to Heitkamp’s strong brand. “I like Heidi. Who doesn’t like Heidi?” a retired Air Force Reserves lieutenant colonel says in a recent spot. Acknowledging her likability is a strategy — “let people feel comfortable voting against somebody that they like,” Cramer said. His untucked shirt tails hanging out over his jeans, Cramer was relaxed and confident at his local watering hole. Unlike Heitkamp, who has to be back in D.C. for the Senate session, he has the whole month of August at home. He could barely finish a sentence without someone approaching his table to wish him luck, ask how the race is going or thank him for his support of substance abuse programming. Cramer’s son, who struggled with alcoholism, died in March. For Cramer, the biggest issue in the race is the perceived strength of the economy, which he says his constituents are feeling. “They’re really pleased with Donald Trump, they’re pleased with Republican leadership, and I get to take credit for my part in all of that,” Cramer said. Cramer argues that the state wants GOP representation, pointing out that he and Republican Sen. John Hoeven are often on the same side while Heitkamp’s the odd woman out. His latest ad, echoing a spot from the National Republican Senatorial Committee, recycles conservative attacks about sanctuary cities and illegal immigration. He boasts that more North Dakotans have voted for him. He won in 2012 with 176,000 votes, while Heitkamp won with 161,000. Hers was a top-tier Senate race, while his House race attracted little national attention. Cramer hasn’t faced a close election since, running unopposed in 2016. Heitkamp’s banking on issues like trade and health care to drive a wedge between Cramer and the state’s GOP voters. The congressman has backed the president on trade — although he now argues he’s never viewed tariffs as good economic policy — saying he supports what the president is trying to achieve and doesn’t want to “undermine his leverage.” In a radio interview, he called Heitkamp “an enemy of our own country” for organizing a meeting at the Mexican Embassy with North Dakota agricultural leaders. But from his perspective, the anxiety about trade isn’t all it’s made out to be. “It’s certainly not as dominant as the media writes about,” he said. Cramer feels similarly about pre-existing conditions, casting doubt on the senator’s statistics about the 300,000 North Dakotans with pre-existing conditions. Democrats are attacking him for supporting a lawsuit brought by GOP attorneys general challenging the 2010 health care law. “I’m a little surprised that they’re trying to use that same national script in North Dakota,” Cramer said, touting his vote for the GOP health care bill in the House as a better alternative that would give more flexibility to states. Heitkamp doesn’t miss an opportunity to criticize Cramer for voting for legislation the president once called “mean.” It’s the focus of her latest ad, the first one in which she calls out Cramer by name. “Health care not only illustrates a difference in priorities and who we talk to in the state, but I think it’s a clear distinction between following and leading,” Heitkamp said in last week’s interview, noting the bills she introduced to reform the 2010 health care law.